As part of our ongoing commitment to ensuring the highest levels of welfare and safety for our staff and visitors throughout the Tuffa site, four members of our team have taken part in an intensive Health & Safety management training programme. The course took place over 4 full days in January at Ridings House in Cannock and was funded by training provider, Performance through People. The Managing Safely course meets the Institute of Occupational Safety & Health (IOSH) standards and was provided by Health & Safety expert, Graham Ewers. The training consisted of seven modules including Risk Assessment, Occupational Hazards and Investigating and responding to work related incidents. At the end of the training, the Tuffa team sat an exam on the training given, with all passing first time. Tuffa UK HR and Office manager, Kerry Shenton was one of those who attended the training and passed the course. Kerry explained the importance for Tuffa. “As a business we have a responsibility to our staff and visitors to make sure our site and environment is the safest it can be. This course covered all aspects of staying safe at work and provided guidance on how a professional Health & Safety Management System should run. Key management staff as well as our maintenance operative undertook this training and I’m delighted that we all passed our end of course exam,” she said. “This course and our Health & Safety Management Programme will also help us to prepare for our ISO45001:2018 Certification application later this year, ” she added. The Tuffa team that attended and passed the IOSH Managing Safely course. 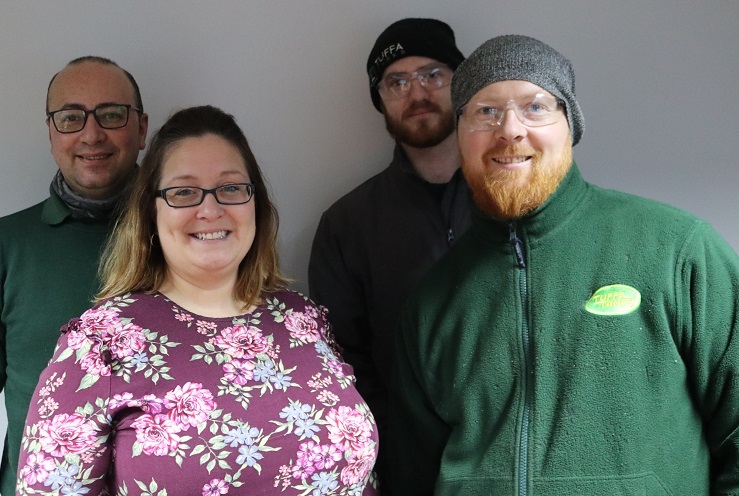 Pictured (left to right) are Meena Sedrak, Maintenance Operative, Kerry Shenton, HR Manager, Nick Hayley, Plastic Tank Supervisor and Martin Maras, Steel Workshop Manager. Congratulations and well done to all of you! Thanks for working hard to keep us all safe at work.